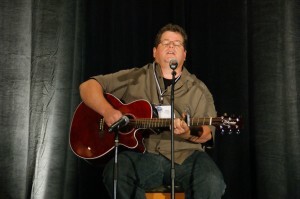 Alan Pedersen had known his way around Nashville as an award winning songwriter, successful recording artist, stand-up comedian, and network radio news reporter. But on August 15, 2001 life as he knew it changed forever when Alan’s 18 year old daughter, Ashley Marie Pedersen, was killed in an automobile accident in rural Colorado. Alan began to find healing as he attended meetings, and then became actively involved with the Littleton, Colorado Chapter of The Compassionate Friends, finding that he did not have to walk his grief journey alone. In 2003, Alan started giving back as he began traveling and sharing his music and story with other The Compassionate Friends Chapters. What started out as a “daddy taking a road trip to honor and remember his daughter” has now blossomed into a full time ministry as Alan has turned his journey through grief and pain into a collection of powerful and moving songs. To date, Alan has played concerts and spoken at over 500 events during this “road trip” including nearly over 300 TCF Chapters. Alan, who is a Certified Grief Recovery Specialist, has founded GRIEF AND BEYOND: a multimedia non-religious ministry offering support to organizations, families, and individuals going through the grief process. Currently they are on the road as part of the ANGELS ACROSS THE USA TOUR which is sponsored in part by bereaved families in honor of their children, grandchildren and siblings. The Angels Across the USA Tour is both amazing and moving. Alan has traveled ALL 48 contiguous states; the faces of “The Angels” gone too soon from our lives, made into butterfly decals, adoring the Angel Trailer that passes through every town. These bright, mostly way too young, faces reminding parents to hug and cherish the children they have, while not forgetting those we have lost. Alan does not charge for any event, as this is his “ministry” and way of honoring the child that he has lost. His travels have included over 150+ cities, featuring at least one concert event in each state. The goal of his ANGELS TOURS is to provide comfort, caring and understanding to the bereaved, while raising community awareness and draw media attention toward local grief organizations that provide resources for the bereaved.